It can be easy to overlook most of the site tools because, quite frankly, they don’t do much. And it can be even easier to forget about the additional Site Settings, because they are hidden away under the Model Site section on the Massing and Site tab. This little dialogue is also doubly tricky, since it has some settings that you might expect to find elsewhere. But if you ever need to adjust the contour line intervals, Topo section cut graphics, or Property Line units, this is where you need to go. The Property Data section at the bottom is essentially the default units used for Property Lines, though I think it would make a little more sense if these were located in Project Units (I know that is where I first tried to find them). 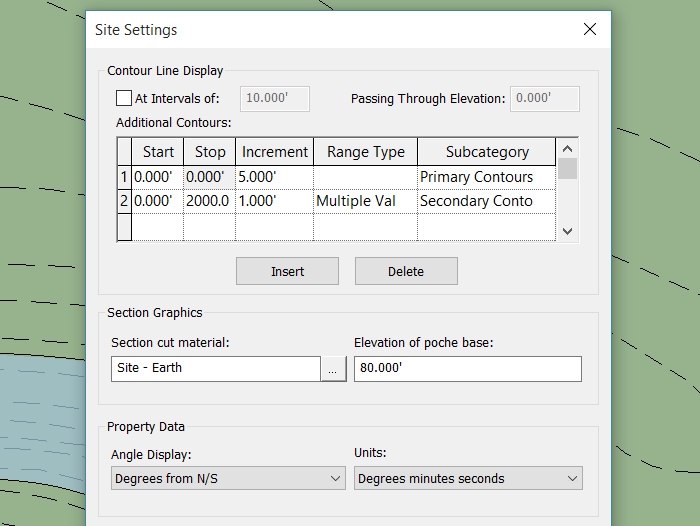 But apparently the Object Style material only applies to the surface of the Topo, while the Site Settings material applies to the section cut. And the elevation of poche base (which I have never really noticed or used) will adjust how far the section cut poche extends. Though this only seems to apply to 2D views (Sections and Elevations). It does not apply to the poche of a Section Box in a 3D view (which will still extend forever). But the most crucial of all the Site Settings is the Contour Line Display at the top of the dialogue. 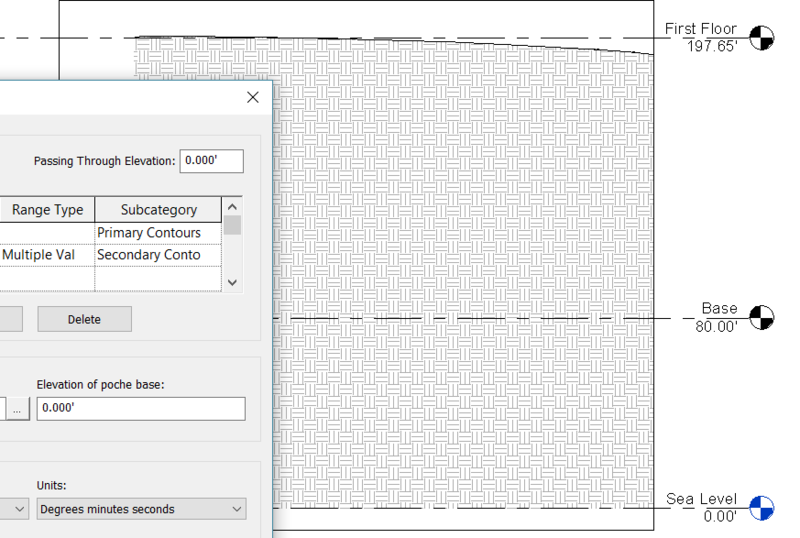 Here there are two separate settings for displaying contour lines: the “At Intervals of” radio button and the Additional Contours table. 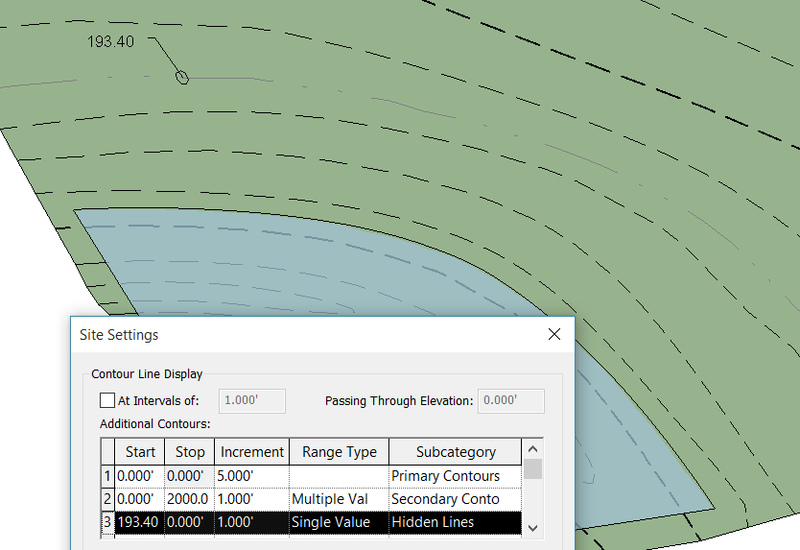 I assume the At Intervals button is just an older option that was never removed, since it is both redundant and less versatile (the contour lines created with this option will automatically be assigned to the Primary Contours subcategory). I do not use this option, instead I just use the Additional Contours. As you can see, you can easily configure Primary and Secondary to have the correct increment and subcategory. Just make sure your Start and Stop values extend low and high enough. But these Additional Contours can also be used to create custom contour lines. For example, if you had a river or reservoir with a certain flood elevation you can create a contour line (at 193.40) to show the flood level. 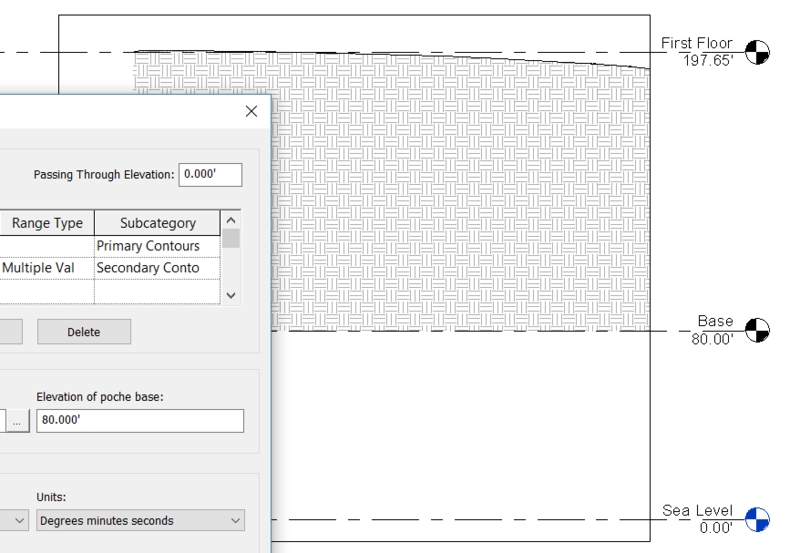 And you can even create your own Subcategories to house various of custom contours. I was inspired by your previous post, and wanted to create with dynamo a 3D geometry of a water area, but i still didn’t find a way to make an intersection with the topo mesh. While searching for a solution I found that when you extract the geometry of a topography in Dynamo, it gives you a mesh, and a set of Polycurves. 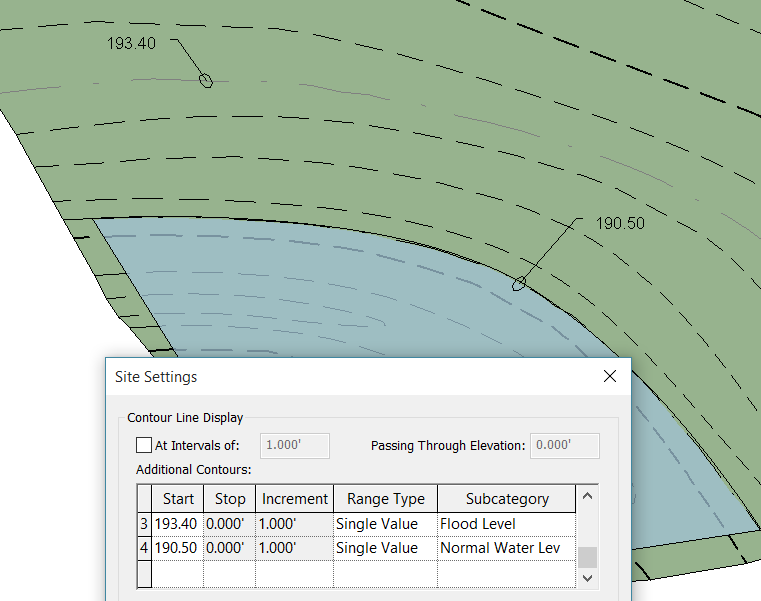 Those polycurves corresponds to the contours defined in the site settings. I didn’t find yet a way to use it, but I found it interesting. Yes, this is a good concept for a dynamo script. I am just getting started in dynamo, but I think it is possible. I will do a post if/when I find a script that works. Thanks for the comment.